Baby, it's getting cold outside :) Building up an unpredictable weather tolerance is a must for living in North East Ohio. I remember Halloween a few years back was warm and 70 degrees or so, and one year there was sleet. You never know what to expect until the week of. Today it's about 40 degrees right now, so it's definitely getting chillier. First take an old sweater that you dont' mind cutting up. 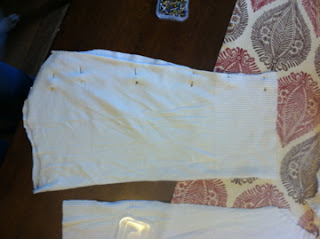 You can either cut off the sleeves at the shoulder, or use the waist like I did. 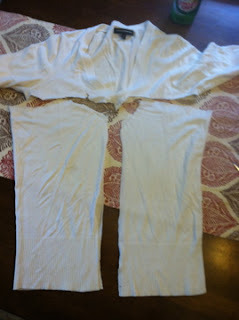 Now, my sweater was cut at the arm because I used it for something else so I wasn't able to use the arms. The arms would be WAY easier! 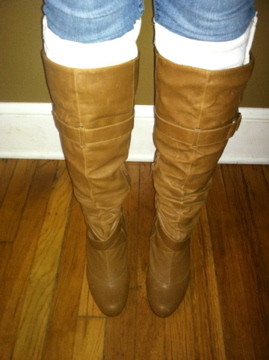 You just cut them off and there is your leg warmer. One step and done. The wrist of the sweater is where you pull it up to your knee and you trim the bottom according to where you want it on your leg. 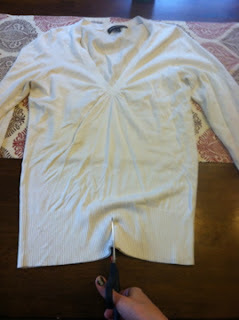 But, if you're like me and can't use the arms or are working with a sweater vest then your step one is to cut down the middle of the sweater. Then across to make two separate pieces. Next you want to turn the pieces inside out and wrap around your leg to get an idea of where to pin and sew for them to fit your leg. Then you pin it, and sew it. It will taper in toward your foot of course. Just do your best. 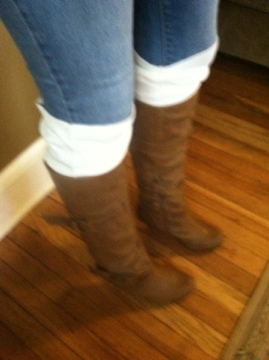 they look cute slouchy as well so when you're pinning allow for seam and any slouch you want your leg warmer to have. Last, turn them right side in and you're ready to work it. 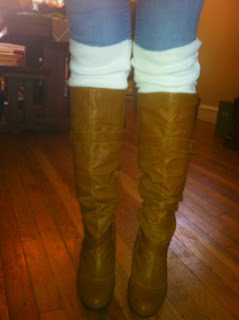 Cuff it, slouch it, have just a little peek out, wear it any way you like. You can even embellish them with buttons or bows along the side, any way you want. Im so excited to try it with a chunky knit, a patterned or striped one, the possibilities are endless. Have fun with it and let me see what you come up with! I cant wait to try this, Love this look! and love your boots!